I am trying to get a mahjong set and I was wondering what the difference was between the Japanese and Chinese tile sets. Mainly I am wondering if I can play Japanese rules on a Chinese set (if I get rid of some of the tiles) or vice versa. It\'s easy to play Japanese mahjong with any tileset. Get rid of flowers, jokers, etc. You should have your 3 suits of 9, 4 winds, and 3 dragon tiles. Four copies of each gives 136 tiles. Red fives are optional, and you can play without them, there\'s no problem. Add any two dice in the mix and you have everything you need, although if you aren\'t comfortable counting points yet, a score sheet helps. Ohh fantastic, answers to all of my other questions. Sorry if I\'m repeating things from other threads, but that\'s very much. Yes you can play Riichi with a Chinese set. All you need to do is ditch the flowers and seasons. You will not get the rectangular Oya marker but you can easily use the Chinese wind marker remembering only to use East :east then South :south. 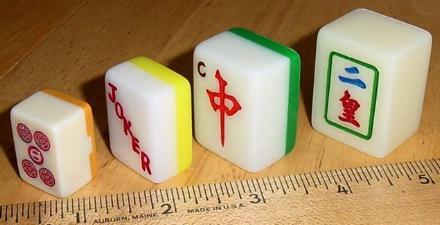 Or you can buy them from Hiro\'s website (http://www.japanese-mahjong.com/windmarker.html) or from Jenn\'s shop (http://www.mahjongmart.com/shop and click on Other). If you want to play with Red Fives you can always paint or otherwise mark the tiles. I used Humbrols Ferrari Red Acrylic Paint (#220) to mark up a set of red fives on a Chinese Tournament Set I had lying around. Japanese tiles are usually smaller. Modern Japanese sets are often Riichi sets with red fives (usually four red-crakred-bamred-dotred-dot) added and 4 seasons (the other flower tiles are dropped). Japanese rules do not use the flower or seasons tiles even if included. Probably the main consideration is Are you comfortable reading the Characters suit, and Winds in kanji? If you can\'t read them or don\'t want to learn them then you would be better going for a CHINESE IMPORT version as there are few Japanese import versions with arabic indices around. Both the Chinese and Japanese sets for the local markets do not have the Arabic indices indicating to the english speaking world. A limited number of Japanese sets are aimed for the export market with indices which will limit your choice if you wish for that style of marking. Crudely speaking Japanese sets are often of better quality carving and are more expensive. They are also harder to get locally without importing and incurring extra shipping and import duty costs. (from Tom Sloper\'s site http://www.sloperama.com/mjfaq/types.htm) which has a series of excellent FAQs which if you haven\'t read, you should as it is one of the most extensive mahjong sites on the net and well worth a read. Having said that I do like the Japanese sets that I have played with. Actually, Japanese tiles often have a surprisingly pleasant heft. Manufacturers add weight to their tiles (probably by metal inside). The tiles for use in machines have magnets in them. Alright, got a Riichi set. I am comfortable reading the characters (I\'m taking Japanese at school). Thank you all for the help, I now have a lot more information if I want to play any other kinds of Mahjong. Now I just need to find people that will play with me... preferably one\'s that can teach me how to play. nazrath wrote: Now I just need to find people... that can teach me how to play. Then dig into the detailed rules after you\'ve got all that stuff down. (the vast majority of Japanese sets I have seen all have 4 seasons/4 red fives or in the case of pre-aka-dora sets have 4 seasons/4 flowers .... these latter sets were common in the 70s but seem to be rare nowadays - partially due to the popularity of Riichi with Red Fives and partially due the redundancy of flowers/seasons and the requirement to pad out the box usualyl results in 4 red fives plus either a set of seasons or four extra blank tiles). In MCR you can choose to include or drop the flowers/seasons. Even if you choose to include these tiles, the MCR rules do not differentiate in these tiles unlike traditional chinese rules ... just use the red fives as flowers with the included seasons. In Trad Chinese, you get a bonus double if you draw your own flower or seasons so each flower or season has to be marked (in western export sets) with 1,2,3,4 to correspond to east, south, west, north to aid the player in identification. However, in MCR, there is no difference between each flower or season. You will of course have to explain to your MCR players that you are using a Japanese set and that you will be using the red fives and the seasons as flowers/seasons. For Trad Chinese and other rules using the full 144 tileset you will have to drop flowers and seasons if you want to keep your walls balanced (I\'m hearing House rule! :)) from the game unless you have an set of non-red-fives Japanese set that has both flowers and seasons. iandstanley wrote: In MCR you can choose to include or drop the flowers/seasons. I never heared MCR have optional parts. iandstanley wrote: just use the red fives as flowers with the included seasons. You already have to manage players who mis-read 1-bam or 1-dot as flowers. Did you realy want to manage players reading red-dot, red-bam and red-crak as normal 5-dot, 5-bam and 5-crak ? Sorry all just checked. When I first learnt MCR I checked out both the official rules and a couple of other more detailed sites (some of which descibe the flowers/seasons as optional tiles including http://www.mahjonged.com/mahjong_intro.html#optional) which helped in the construction of hands. I must have stored this in the back of my mind. Not really but if you already have a japanese set and wish to learn MCR you could play MCR. I would recommend a chinese set to play but you could learn before you make the investment.